Anti-Virus products often claim to have high proactive detection capabilities far higher than those reached in this test. This is not just a self-promotional statement; it is possible that products reach the stated percentages, but this depends on the duration of the test-period, the size of the sample set and the used samples. The data shows how good the proactive detection capabilities of the scan-ners were in detecting the new threats used in this test. Users should not be afraid if products have, in a retrospective test, low percentages. If the anti-virus software is always kept up-to-date, it will be able to detect more samples. 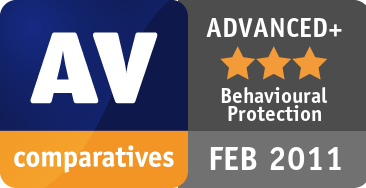 For understanding how the detection rates of the Anti-Virus products look with updated signatures and programs, have a look at our regular on-demand detection tests. Only the heuristic/generic detection capability was tested (offline). Some products may be had the ability to detect some samples e.g. on-execution or by other monitoring tools, like behaviour-blocker, reputation/cloud heuristics, etc. 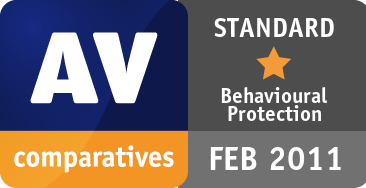 Those kinds of additional protection technologies are considered by AV-Comparatives in e.g. whole-product dynamic tests, but are outside the scope of this retrospective test. For further details please refer to the methodology documents as well as the information provided on our website. This test report is the second part of the February 2011 test. The report is delivered in late May due the high-required work, deeper analysis and preparation of the retrospective test-set. Many new viruses and other types of malware appear every day, this is why it’s important that Anti-Virus products not only provide new updates, as often and as fast as possible, but also that they are able to detect such threats in advance (also without executing them or while offline) with generic and/or heuristic techniques. Even if nowadays most Anti-Virus products provide daily, hourly or cloud updates, without heuristic/generic methods there is always a time-frame where the user is not reliably protected. 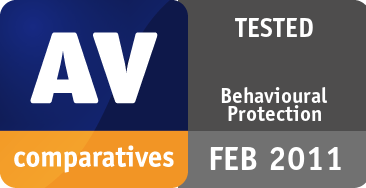 AV-Comparatives prefers to test with default settings. In order to get comparable results we set also the few remaining products to highest settings (or leave them to lower settings) in accordance with the respective vendors. We hope that all vendors willfind the appropriate balance of detection/false alarms/system impact and will provide highest security already by default and remove paranoid set-tings inside the user interface which are too high to be ever of any benefit for normal users. This time we tried to include in the retrospective test-set only malware which has been seen in-the-field and prevalent around the last week of February. About ¼ of the set is considered by us as “very prevalent”. As malware which became prevalentmay be spotted faster by reactive measures when many users got infected, initial proactive rates may be lower (because if they would have been spot-ted proactively, they would not become prevalent as they would be blocked in advance). We included in the retrospective test-set only new malware that was very prevalent in-the-field shortly after the freezing date. Samples which were not detected by the heuristic/generic detection capabilities of the products were then executed in order to see if behaviour-blocking features would stop them. In several cases, we observed that behaviour blockers only warnedabout some dropped malware components or system changes, without protecting against all the malicious actions performed by the malware; such cases were not counted as a block. As behaviour blockers only come into play after the malware is executed, a certain risk of being compromised remains (even when the security product claims to have blocked/removed the threat). Therefore, it is preferable that malware be detected before it is executed, by e.g. the on-access scanner using heuristics. This is why behaviour blockers should be considered a complement to the other features of a security product (multi-layer protection), and not a replacement. The results show the proactive (generic/heuristic) file detection capabilities of the scan engines against new malware. The percentages are rounded to the nearest whole number. Do not take the results as an absolute assessment of quality – they just give an idea of who detected more, and who less, in this specific test. To know how these anti-virus products perform with updated signatures, please have a look at our on-demand tests of February and August. To know about protection rates provided by the various products, please have a look to our on-going Whole-Product Dynamic tests. Readers should look at the results and build an opinion based on their needs. All the tested products are already selected from a group of very good scanners and if used correctly and kept up-to-date, users can feel safe with any of them. The false alarm test results were already included in the test report of February. For details, please read the False Alarm Test February 2011. AVIRA, Kaspersky: asked to get tested with heuristic set to high/advanced. Due to that, we recom-mend users to consider also setting the heuristics to high/advanced. AVIRA: asked to not enable the informational warnings of suspicious packers. Due that, we did not count them as detections (neither on the malware set, nor on the clean set).